In this mini-expansion, you will find tiles with lakes, and ferries that will allow you to cross these lakes. Throughout the game, you will be allowed to move ferries already in play. When you place a tile on a road where a ferry is present, you have the choice to move the ferry to another segment of road, if it is to your advantage to do so. 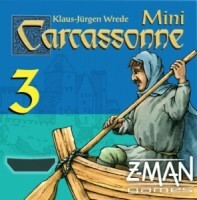 Add a Review for "Carcassonne: Mini-expansion #3 – The Ferries (Second Edition)"